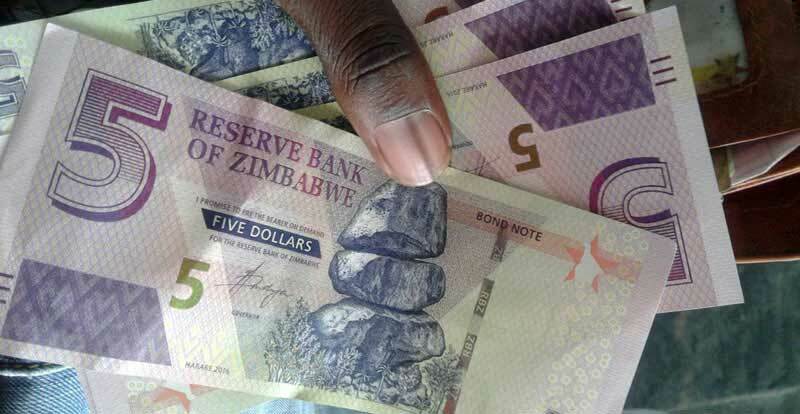 The Reserve Bank of Zimbabwe (RBZ) has introduced the $5 bond note, releasing $15 million worth of the new money into the market. The notes started circulating on Thursday 2 February 2017. The new note is purple in colour and carries images of the balancing rocks and giraffes, as well as the same security features as the $2 bond note which was the first bond note that was introduced in November 2016. Bond notes are a currency alternative pegged 1:1 against the United States dollar. They were introduced as a way of restricting the externalisation of foreign currency and easing liquidity pressures in the economy. Their use is supported by a US$200 million Afreximbank export promotion facility. As such a maximum of US$200 million worth of bond notes is expected to eventually end up in circulation. With this latest $15 million injection, a total of $88 million in bond notes is now in circulation. The RBZ has given assurances that it won’t flood the market with the surrogate currency to avoid the effects of inflation. The governor of the RBZ Dr John Mangudya has also encouraged citizens to not rely entirely on cash but to embrace electronic payment alternatives as a way of arresting the country’s “cash-first” culture. In Zimbabwe’s multi-currency environment, this culture, paired with the import based nature of the economy, has placed a significant premium on foreign currency. The Media keep stating that “Their use is supported by a US$200 million Afreximbank export promotion facility.” has anyone actually seen any evidence of that, or are we all just being fed the RBZ press releases in the name of journalism? Maybe it is in the same place where the $15 billion in missing diamond revenue is.